You are here: Home / PMI Industries, Inc. Since 1969, PMI Industries, Inc. has specialized in the design, manufacture & testing of highly reliable cable systems and hardware for harsh marine environments. Riding on more than 40 years of success from its initial product offerings, PMI had not unveiled any new products in some time. During the last two decades, the seismic market that PMI serves had moved from Texas to Western Europe. PMI is located in Cleveland, Ohio, while a majority of their current customers are overseas. This coupled with the fact that many of their customers did not fully understand the full scope of its product line or services offered, resulted in their European competitors overtaking the market. Company CEO, Bob Schauer knew that in order to survive another 40+ years, PMI would need to shore up its position as a leader in the underwater marketplace to impact growth. “We have a stable line of products that are recognized as market leaders,” said Schauer. “We needed help promoting ourselves correctly to reach the right people.” Felber PR & Marketing knew that PMI needed to position itself as the designer, manufacturer and solution provider of choice for the marine cable protection industry. The PMI brand needed a refresh to reflect its vision for the future, which included several newly designed products and a larger, more global presence. In order to signal a change in that direction, Felber PR & Marketing determined that a complete rebrand was necessary to impact advertising campaigns as well as visibility at international trade shows. Felber PR & Marketing created a new PMI logo with an updated, European look to imply their global presence in the marketplace. The logo included a sleeker, thinner design with a reflection of the PMI name to show the company’s clear vision of growth. The company’s message was also more clearly defined to streamline its communications and ensure that its customers fully understand what PMI does and the products they provide. 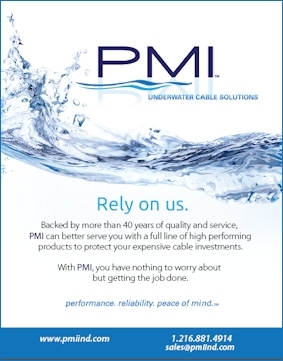 The new tagline—PMI Underwater Cable Solutions: performance. reliability. peace of mind.—positions PMI as a reliable designer, manufacturer and solution provider for the marine cable protection industry. The message conveys that PMI’s products are more robust than its competitors, thus minimizing expensive downtime. Felber PR & Marketing designed new trade show displays using the new company logo and message that focused on their best-selling products and their testing and engineering services. https://www.felberpr.com/wp-content/uploads/PMI-new.jpg 340 730 Allison Miller https://www.felberpr.com/wp-content/uploads/FelberPR-logo.gif Allison Miller2017-05-30 16:07:082017-05-30 16:07:08PMI Industries, Inc.